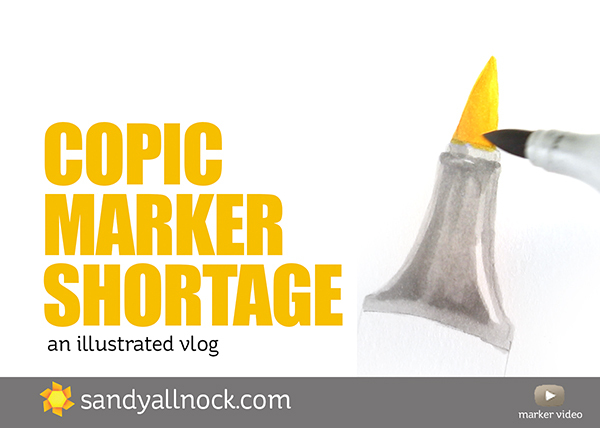 For some time you’ve likely been noticing there are not many Copic markers available, either in brick-and-mortar stores or online. Don’t blame your retailer…the demand has just grown so fast that it’s exceeding production! Please know that I wasn’t asked to create today’s video – nor am I compensated by Copic for this. I reached out to them for information to pass along to you about why there are so few markers for us to get our hot little hands on! I knew that our retailers have been having trouble getting markers for us. And with my Copic Jumpstart class coming up, the shortage has become more urgent! And doing some research – I found that it’s not a shortage, they’re making more markers than ever. It’s just not enough. I contacted my friend Marianne at Copic to ask what the reasons are. She wrote me a hilarious explanation back, which I adapted to turn into this explanation. She mentioned squirrels – which then led me to this absolutely silly drawing of a rodent in love! He really wants you to be in love with Copics, not his tail. 🙂 Watch the video below, or click HERE to see it in HD on YouTube. Annnnnd the finished silly squirrel in love…LOL. I hope the explanation helped give you a little peace of mind. More markers ARE coming. It just takes time. The retailer has invested a lot of cash on those colors – and can’t bring in other cool products for us. Those markers are now out of the “pool.” So if another store is dying to get their hands on a Y17 and they’re all in a different store – the other store can’t get them. Gah. When visiting your brick and mortar retailers, if you request a special order of a pen, buy it there. Same reasons as #1! Gather with your community colorists! Get a Copic coloring group together monthly…you can share colors with each other, reink each other’s pens…plus it’s lots of FUN! Get together at a local scrap or stamp store if you can, and support them by shopping there. Share this video or blog post with your friends. Let them know too! No longer a shortage, but prices did hike. Imagination international is ending its relationship with Copic/Too —the manufacturer hiked prices way up over a year ago and III ate the increases but couldn’t keep doing it. I’m not sure what Copic/Too will do with pricing now that they’ll be doing their own distribution or when the switch will take over (or if it already has). Hi Sandy, do you have an update on the situation? We have been waiting a year and six months for my son’s markers. Is there something else going on? No, but I’ve seen more stores with fuller shelves. Seems to have gotten past the logjam, but some shops run out as soon as they get stock. It doesn’t explain why they have an ink shortage too. Guess the squirrel drank the ink! Thanks for researching this. Now we know. Love the squirrel. Great info Sandy! Thanks for sharing! I haven’t signed up for your clad yet, but I will very soon! Knowing that I wanted to do that, I was checking a few markers that I thought I might want to refill before your class. I had my markers all out, deciding on a few other Various Ink colors I would buy, besides the colors for my markers that are completely dry. That is when I was taken by surprise trying to order all of my refills from the same place, as to not pay shipping. So. I am waiting and hoping to be able to order them soon. Yes! They are worth the wait! I just need to remember there was a time when I had half the markers I have now. I made it through the first class I took just fine with those colors. My last Copic order was placed in November and I just got the last back ordered markers two weeks ago. Thanks for the video. I have your hex chart so I’ll be using it to find substitute colors if need be. My Spectrum Noir markers may have to come out to play if there’s no choice. I have used them with Copics and they do play well together. Looking forward to the class! Thank you for the SA uniqueness, wit, and talent. You’re a very special lady. Thanks for the video, it was informative and entertaining. I am looking so forward to the class! The squirrel is great and so is your explanation! What a cute and lighthearted way to explain a business situation! 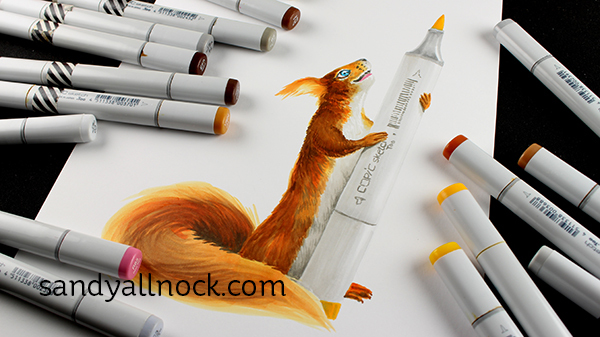 That squirrel is adorable and I’ll never get tired of watching you color. As for me, Copics are worth the wait. Love the explanation and especially the artic squirrel. Waiting for the start of class. Thanks for the great information! I had no idea the nibs were done by hand! I’m fortunate enough to have the full set (which took me YEARS to accumulate), but am feeling the pain of finding replacement nibs and some refills. Looking forward to the class! Sandy – thanks for the info – but why oh why are the Various Reinkers also out of stock? No nibs – just ink! And while I’m waiting, what can I do to save my Copic Sketch markers that need refilling – some are dangerously dry already! Love the video and appreciate the info on the shortage. And thank you for a reminder about your upcoming class. I have been busily procrastinating but won’t now that you talked about it. Thanks and love the drawing. Sandy, thanks for the marker shortage video! Love the squirrel. FYI the link to Marianne’s blog is going to the wrong location. Her blog is http://ilikemarkers.blogspot.com/ and it has so much good Copic info, I wouldn’t want anyone to miss out on it. Whoops! Typed too fast. Thx. I got the private message when I clicked on it from the email BUT when I went direct to the blog I was able to watch it…hope this helps others! It’s a helpful video! Fixed now. Error in publish dates. Even tho I’m on Team Pencil, I really wanted to see the video about Copics. But I get a message, “This video is private.” It comes up on your blog & Youtube as well. Not sure what’s going on. I have to think the coloring book craze (which I’ve greatly perpetuated) is partly to blame. Fixed now. Error in publish dates. Nothing to do with coloring books.